Senators Barbara Boxer (D-CA) and Jeanne Shaheen (D-NH) recently introduced a bill that tackles an important subject in global security: the under-representation of women in the world’s security forces and, in particular, United Nations peacekeeping operations. The Enhancing Military and Police Operations through Women’s Engagement and Recruitment Act of 2016 seeks to increase the number of women in armed forces and peacekeeping through better use of existing programs to support their training and deployment. That’s a great step, but with a tiny bit of money to provide direct incentives and the support of our allies, the United States might be able to bring the percentage of women in UN Peacekeeping Operations up four-fold. As the bill notes, “Female military and police can provide critical contributions to security.” Not least “studies demonstrate that the inclusion of higher proportions of female peacekeepers is associated with fewer allegations of sexual abuse and exploitation.” This is a big issue: there have been 106 formal allegations of sexual misconduct reported with regard to peacekeepers in the 18-month period beginning in January 2015, and surveys suggest the problem may be much bigger than that. But an increase in the proportion of women in a peacekeeping operation from zero to five percent reduces the expected count of allegations by half. Beyond that, the presence of women peacekeepers has been associated with more successful operations overall and it should have a global demonstration effect regarding the operational abilities of women troops. Despite these realities, of the 106,286 UN military and police peacekeepers active in July 2015, a mere 4 percent were women. And on current trends, we’ll hit gender parity in UN peacekeeping forces sometime around the year 2352. 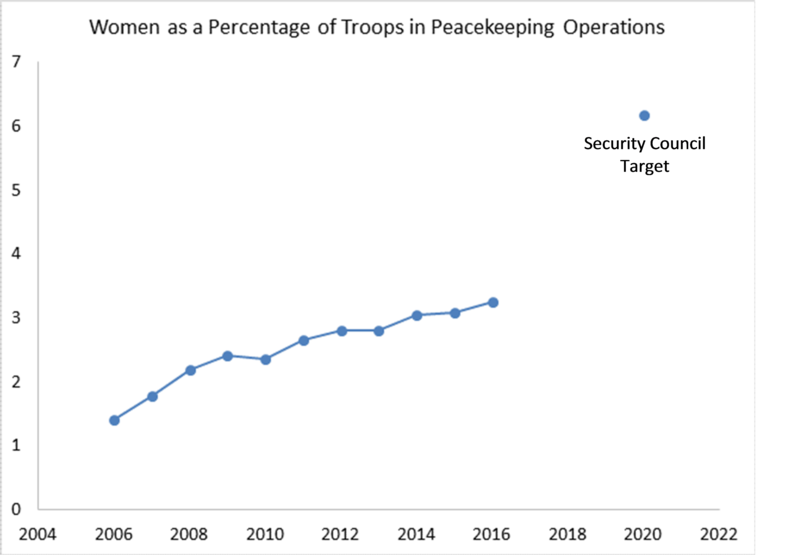 The Security Council recently called for a doubling of women in peacekeeping by 2020—and if we are to meet that target, we’ll have to dramatically accelerate progress (see the chart below). And that will take a lot more than exhortation. In 2009, Secretary General Ban Ki-moon launched a campaign to increase the share of female peacekeepers to 10 percent in military units and 20 percent in police units by 2014. We utterly missed those targets. There is an important role for more training and deployment support aimed at women. The Boxer-Shaheen bill highlights the Global Peace Operations Initiative—a US program to train, deploy, and build the capacity of peacekeepers worldwide, which has helped double the number of female military peacekeepers deployed by participating countries over the past five years—for example, adding more than 1,000 women troops. It calls for another doubling over the next five years. And the bill also calls for a doubling in the number of women from other countries being trained in US military schools over the next four years. But there is also a role for direct incentives. There is evidence that the countries who provide peacekeeping troops respond to financial inducements when it comes to those troop commitments. There is also evidence that the block to increasing the female share of peacekeeping operations isn’t an absolute lack of female troops in sending countries but a reluctance to deploy them. Money could help overcome that reluctance. The US, Japan, France, Germany, and the UK between them account for about 60 percent of the peacekeeping budget. If the US was to band together with major financing countries, it could set up a trust fund supplemental payments to major troop-contributing countries that provide women peacekeepers. The UN provides base compensation of $1,410 per month per peacekeeper to contributing countries. If the trust fund provided a 20 percent supplementary payment for women peacekeepers up to the point where women accounted for one fifth of those deployed on missions, that would add about one percent to annual peacekeeping dues—if the US paid into the trust fund in proportion to its share of peacekeeping dues with Japan, France, Germany, and the UK, its share would be around $30 million a year. That’s about one half of one percent of the State Department’s foreign military financing budget. The UN Security Council and the UN Secretary General have repeatedly called for more women to be involved in UN peacekeeping operations. They are right to do so and Senators Boxer and Shaheen are to be commended for highlighting the issue in Congress. But while exhortation and training help, they are unlikely to be enough alone. If we’re to make real progress towards gender parity in peacekeeping, it is going to take money. The good news is that it is unlikely to take very much money.